EContent magazine released its yearly list of the 100 companies that matter most in the digital content industry. EContent magazine, a leading authority on digital publishing, media, and marketing, today announced the release of the EContent 100 List of Companies that Matter Most in the digital content industry. For the 15th year in a row, EContent acknowledges a wide variety of companies that make digital media professionals more effective at their jobs. Each year selection of the companies for the EContent 100 List falls to a team of judges including editors from Information Today, Inc., EContent magazine contributing editors and columnists, and other industry experts. The 2015 lineup of judges also included several new faces, bringing fresh eyes and expertise to the panel. 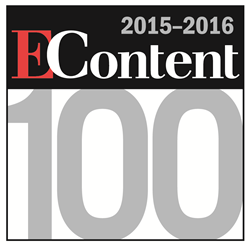 To view this year’s 100 companies that matter most in the digital content industry, visit http://www.econtentmag.com/Articles/preview.aspx?ArticleID=107559. EContent magazine focuses on the business side of digital publishing, media, and marketing, targeting executives and decision makers in these fast-changing markets. By covering the latest tools, strategies, and thought leaders in the digital content ecosystem, EContent magazine and EContentMag.com keep professionals ahead of the curve in order to maximize their investment in digital content strategies while building sustainable, profitable business models. EContent magazine is a publication of Information Today, Inc.